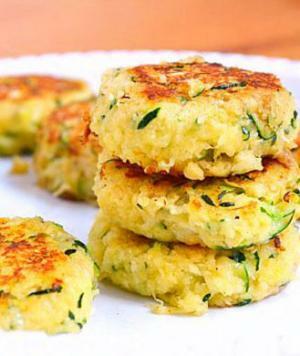 Each scrumptious morsel is totally satisfying and packed with vitamin-rich zucchini, yet strikingly low in calories, carbs, and fat. Remove excess liquid from freshly grated zucchini by placing them between paper towels and squeezing. In a large bowl, combine all the ingredients. Mix thoroughly. Heat a large pan on medium, and spray with Pam. Shape spoonfuls of the zucchini batter into 2-in. (diameter) patties, and drop onto the sizzling pan. Cook each side for about a minute and a half, or until the outside is golden brown. Finish the cakes off in the oven. Stick them on a baking pan and broil them for 1-2 minutes. Serve hot, alone or with ranch dressing.